Chỉ tìm trong THIẾT BỊ HỖ TRỢ SỬA CHỮA. Thông báo về nội quy chia sẻ file và giải pháp khu vực kỹ thuật. Thảo luận trong 'THIẾT BỊ HỖ TRỢ SỬA CHỮA.' bắt đầu bởi namnhatrang, 18/11/16. With this feature can unlock unlimited FRP Hisilicon, Qualcomm and Mediatek based phones . FREE for users with FRP activation. "Sai mà nhiều, đúng được bao nhiêu" bỏ qua cho mọi sự vô minh. LATEST Huawei 2K Platform only on DC Unlocker. Added safe repair method with factory firmware - without erase NV, IMEI. Huawei 2K platform flashing support added. Direct unlock, repair IMEI, MEID, Bluetooth, MAC, SN, Vendor, Country and etc. No ROOT, no ADB, no credits ! World first. Full info and how get free license here. Huawei Hisilicon NV partition backup writing added. NV partition writing may be required if phone was erased or had an empty board. Just read one phone backup from any described Hisilicon phone, and get free 3 month license . Need to have enough experience for the process - we won't be able to help about it. DC-unlocker is not responsible for any damage done to your device - do it at your own risk. Flashing all files in all modes automatically with one button. Now Huawei full stock firmware can be requested for free. Bootloader code read, FRP unlock, Huawei ID unlock , Repair IMEI, MEID, SN, MAC, BT, Vendor, Country added. PCBSN writing added (with time license only). SINGLE/DUAL sim writing added for qqcom models. DC Unlocker v.1390 Huawei E5577, E5770, R216 and other Auth4 unlock in one click! Supported not customised modems and routers. Safe! No downgrade no flashing required! World FIRST added new HUAWEI platform MATE 10 and Mate 10 Pro support. Huawei Diego (Dig-) flashing support added. NOW all HCU-Client timed license users can use DC-Phoenix (from v45) for free !!! New support area with 3K+ firmware, customisations, board software, NV backup files ! FREE CHRISTMAS LOTTERY for gsmhosting users without buying anything. You can instantly win 300 one day, 200 three days, 30 one week, 10 one month HCU-Client & DC-Phoenix timed license accounts. 4.Post success HCU or DC Phoenix success (or error) log here, and win additional 10x1 month accounts. Huawei MATE 10, Mate 10 pro , Honor V10 and similar latest phones. Bootloader, FRP code reading, imei, meid, sn, board sn, vendor, country repair, FRP unlock, Huawei ID unlock. Bootloader, FRP code reading, imei, meid, sn, board sn, vendor, country repair, FRP unlock, Huawei ID unlock, network unlock. 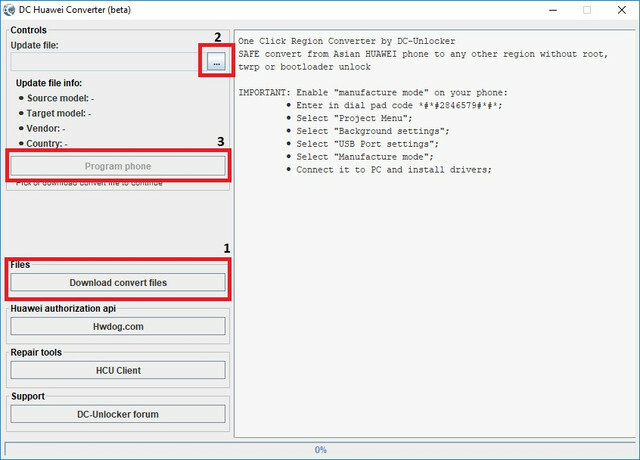 DC-unlocker presents new tool (currently in beta) for converting phone's region. (for example from NXT-AL10 to NXT-L29 etc.) without root, twrp or bootloader unlock. Tool is currently free to use. ➤ Before proceeding make sure your computer has HiSuite installed. It will be necessary for drivers. (HiSuite software itself should be closed during whole process). ➤ After launching the tool read the startup message. ➤ Connect phone to PC and Enable manufacture mode on your phone by entering *#*#2846579#*#* in it's dialpad. Make sure to accept connection if phone shows authorization request box on it's screen - without it phone may be not detected on the tool. ➤ On DC Huawei Converter press "Download convert files" and download one of the available files for your phone model. After file is downloaded select it under "Update file" field, it will take some time for software to read the file. ➤ Now you can start conversion by pressing "Program phone" button. After conversion completes, phone restarts/resets. In future, DC-unlocker plans to remove support for new Huawei phones (already added phones will remain supported) and transfer it to HCU only, while DC-unlocker client will keep receiving updates for modems and routers. Activating HCU will include DC-phoenix activation and UNLIMITED SUPPORT - won't be necessary to pay annual support for dongle. HCU can be activated on Vygis or infinity dongle without dc unlocker activation. With dongle, there will be no PC lock like with timed license user account! After 18th of September price for all users - 99 credits. DC-Unlocker update for NetGear 815 & ZTE Airtel WD670! NetGear AC815S & ZTE Airtel WD670 unlock now available! DC-Phoenix v65 update! region/demo conversion for new phones p20, p20 pro and other..
Bootloader loading in Huawei 1.0 port or testpoint (now can start ram loader and fastboot alone from testpoint). Region conversion, demo conversion for many phones included P20, P20 pro and other. Speedup process for flashing in fastboot, no extracting to disk required anymore. Procedure is risky, adviced to attempt it only for advanced users, read and investigate as much as possible about your mobile before doing anything. Each new model is based on different hardware therefore any file won't fit it. Bootloader, FRP code reading, IMEI, MEID, SN, PCM SN, Vendor, Country repair, FRP unlock, Huawei ID unlock. * FRP and Hauwei ID unlock in Huawei USB COM 1.0 mode for Huawei P20,P20 PRO and previous supported phones.